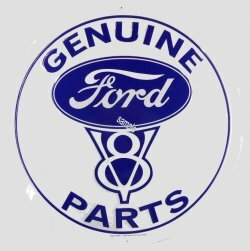 FORD genuine V8 parts - $10.00 : Bob Hoyts Classic Inspection Stickers, Add a Final Touch to your Restoration! This 1950-1960s Ford Logo has been carefully restored and reproduced with our patented "Peel and Stick" format that allows buyer to place it inside your classsic car window.. It is appoximately 3 inches square and can be cut by customer to be round, or left as is with white square background.